Hello! It's time another Sparkle Creations Rubber Stamps Challenge! Thanks to all of you who played along last week! Each week we will post an all new challenge at this time (9 PM PST on Mondays). For all the details, please visit the SCRS blog. 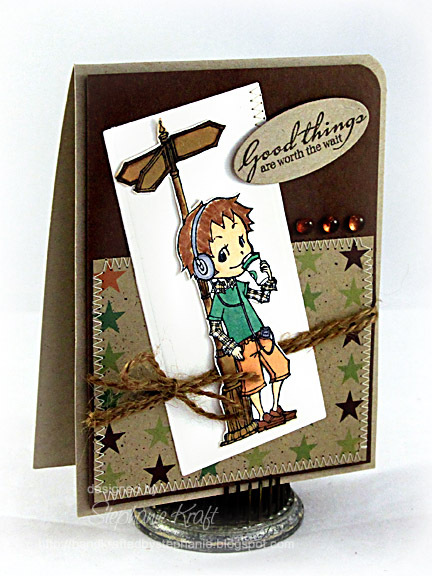 This week's challenge is to use Kraft cardstock and/or other Kraft goodies on your creation. I paired Street Corner Josh with some Kraft cardstock and Kraft patterned paper by Jillibean Soup. I colored him with Copic markers, cut out the image with a Spellbinders Long Rectangle Nestabilities die, and promptly dropped an open ink pad on top of it... argh! However, I managed to salvage my image (minus the steam from his coffee) and cut him out and put him on top a new (clean) background. The sentiment reads "Good things are worth the wait" and is from Verve's Big Wish. I used Mojo Monday 166 for my layout. For more inspiration, please visit the SCRS blog to see the design team's wonderful creations and their individual blogs for more details: Kim, Laurel, Lisa (on vacation), Simonne (running a bit late), Sparkle and Mercy, our wonderful November guest designer! Are you a Black Friday shopper? How about being able to shop at home in your pjs? Sparkle is having a HUGE sale.. All stamps in the store will be $5, which is almost 40% off! The sale will run on Black Friday from midnight to 6pm EST (9pm Thursday through 3pm Friday PST). Accessories: Long Rectangle Nestabilities, Mega Oval Nestabilities (Spellbinders), Round-it-All (Zutter), Markers (Copic), Dew Drops (Robin's Nest), Jute twine, Foam tape, Thread, Sewing machine. Super cute card! I love the twine you put behind him! Such a darling card! I love the star paper! beautifully done, stephanie...awesome job on this week's challenge! Great design and love the paper you used with him.